Go to the Registration Page and fill out the form. After filling out the registration form, please follow the payment instuctions, we accept cash, check or you can also pay secure online via credit card. Once we’ve received your registration information, we’ll contact you to schedule your pre-camp evaluation. We will give you an introduction to Boot Camp and answer any questions you may have. We will also review your medical history. We will take a few simple measurements to see where you are prior to beginning camp. We don’t care what the measurements show. It’s strictly for a post-camp comparison. These numbers and all other information will be held in the strictest confidence. We will record your weight and measure your body fat percentage. Again, the numbers don’t matter. We just want to be able to measure your improvement. Don’t be surprised if you see a 3-8% reduction in your body fat over the four weeks! You will receive your Welcome Packet and Boot Camp T-shirt. You will need to bring one set of 5 – 8 lb. hand weights and any type of exercise mat. You will also want to bring water to keep yourself hydrated during camp. Optional items are a towel to dry off with and gloves or mittens in the winter . Dress in a layered fashion…even if it is chilly, you will get warm very fast! 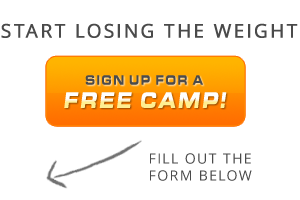 If you are unable to attend camp due to circumstances out of your control, we can offer you a refund if you notify us prior to your session start date and there is a $50.00 cancellation fee. 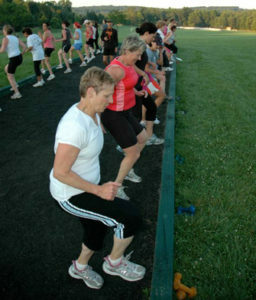 If we are notified after your session begins, we can only give you a credit towards another boot camp. This credit is nontransferable, and must be used within 12 months. There is no cash refund. This is not negotiable. What if I have to miss a camp day? 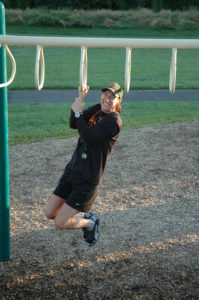 No problem, we will provide you with an at-home or on-the-road “Adventure Workout” to follow for those missed camp days so you may keep up with boot camp where ever you may be. Performance improvement can take place in as little as three days. “Visual Improvement” can take from two to four weeks depending on your effort level. It’s becoming common to see a camper go down 1-2 dresses sizes within the first camp . Remember, everyone is different!